I’ve always been weary of pickling anything myself at home. That all ended when I came home with a ridiculously large bag of loot from the local farmer’s market. Squash, onions, something called salt and pepper cucumbers (addictive, btw). I sorta may have possibly gone a bit overboard. A little of this, some of that. You know the drill. It all seemed fine and dandy until I got home and started to unpack my treasures. I could throw a massive fry party (as we do down here, y’all), and still have tons of veggies left over. It was time. I had to jump into the pickle pond. Turns out that this was something that I should have done years ago. I started with the red onions because, honestly, they were my least favorite thing in the bag. If I was going to royally screw something up, an onion was going to take the blunt of it all. Onions just haven’t ever been on of my favorite things. I wouldn’t even say I enjoy them. At all. That was until recently. I’m pretty sure when you hit a certain birthday that will remain numberless, you just start to like everything you used to hate. Onions, mustard, bell peppers, going to bed crazy early. Those sorta things. While I still (oddly enough, since they’re friiiiiied) hate onion rings, I’ve grown to enjoy raw onions on things. Burgers, in particular. It was time to give it all a bit of a bump. I can’t say that I enjoy forcing my entire kitchen to smell like vinegar for the day, but the result of this exploration into onion land was a great success. The pickling softened the onions just a bit, but left that astringent bite that I’ve grown to sorta enjoy. Pickling everything in sight lately has also been a great supporting use for my overpopulated home-gardening habit. As I’ve discussed on the blog before, I tend to have the desire obsession with growing everything that I can get my hands on. This year, that included dill, 5-6 varieties of hot peppers, coriander seed (by way of horribly evil cilantro plants that don’t cooperate), and garlic chives, to name just a few. With home-pickling, you can just toss in whatever is overgrown and it will probably taste great. I’ve since made about 10 different batches and not one was just awful. 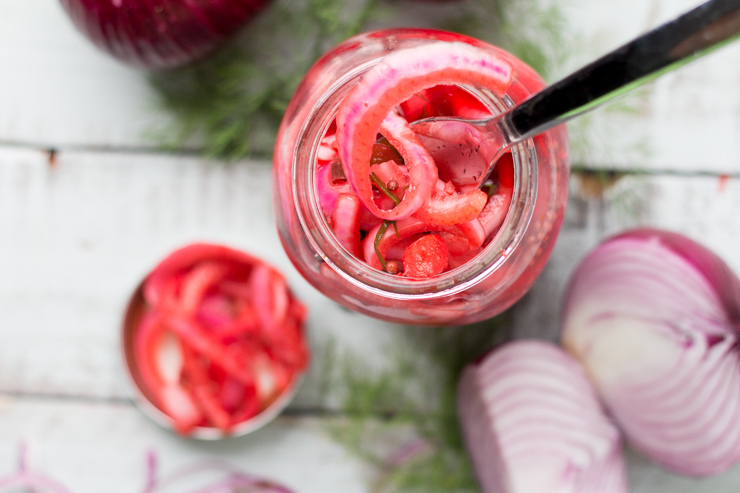 Try changing things up with some hot peppers or vegetables that you might not normally think to pickle. Pickled squash with a brine heavy in dill is currently a favorite of mine. Be sure to subscribe to get a sneak peek on that later! Now that I’m hooked on this whole pickling thing, I’ve ordered a ton of Ball jars to stock my pantry with everything and anything that I can squeeze inside of them. Enjoy, y’all! My favorite use for these onions is on salmon. Great on burgers, too. Slice red onion into thin strands, or as desired. I prefer to use an apple peeler/slicer for long perfect spirals. In a medium saucepan, add water and bring to a boil. Add garlic, jalapeño. Cook for a minute or two. Add vinegars and salts. Stir. In canning jars, divide onion and remaining spices. I used one large quart canning jar for mine. Carefully pour hot vinegar solution into jar(s). Place clean lids and seal. Let cool completely. Store opened jars in refrigerator for use. You can enjoy these as soon as a couple hours later, but they soften and get better with some time. Favorite food to can/pickle? Anything interesting? 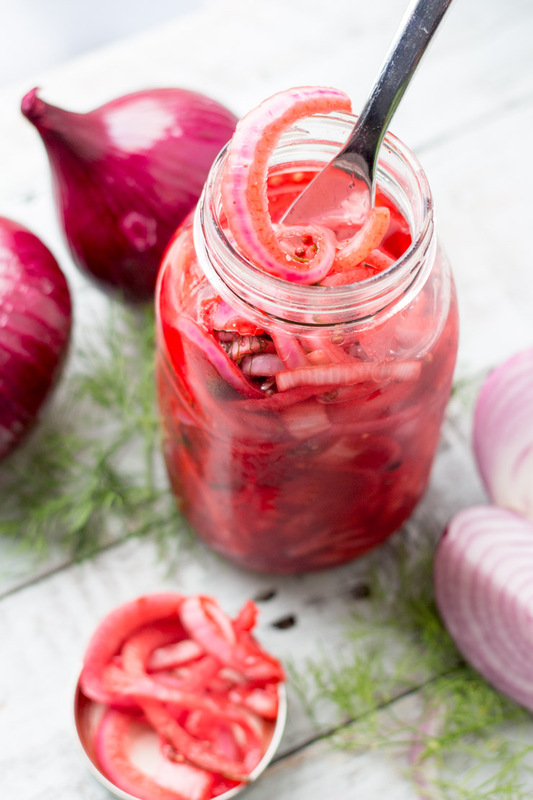 Pickled onions are a staple in my fridge! Perfect with braised pork or beef tacos 🙂 This version looks fantastic!! 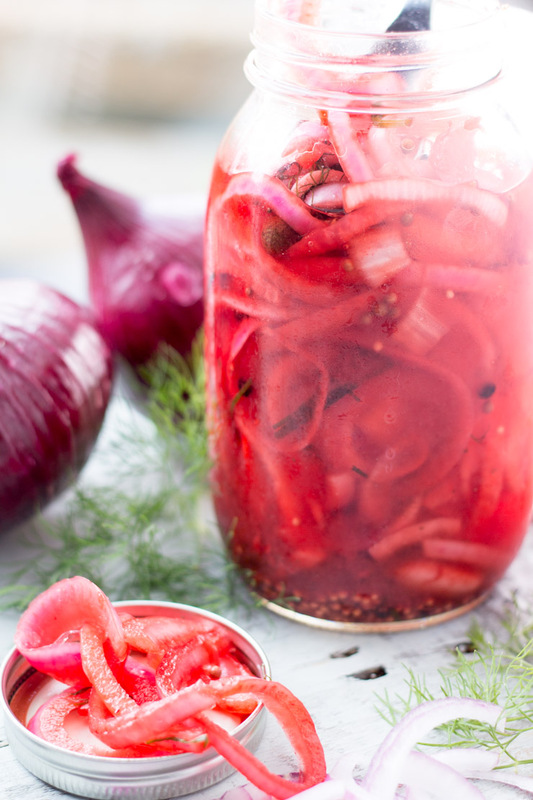 Hi, I always use sugar in my pickled onions……but this recipe looks great! I’ve made this exact recipe with a tablespoons or two of sugar added, and it’s great. Just left it out in the end because I wanted something with a little more of a bite. Enjoy!